Annika, Enfald, Freja, Halta, Kalle, Kanin, Kjell, Leende, Leka, Linnea, Magda, Utforksa, Vandra and Vilse (but not Anka, who's in Boston) spent the day wandering the City of Brotherly Love; they visited the Liberty Bell at Independence Hall, Philadelphia's famous Love Park and City Hall. They brightened the days of half a dozen security guards and scared some carriage horses. 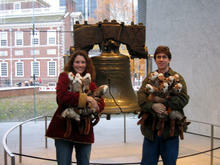 After sending the weasels through metal detectors, X-rays, and baggage screeners at the Liberty Bell, we can assure you that they are clean and harmless, if a bit rambunctious.